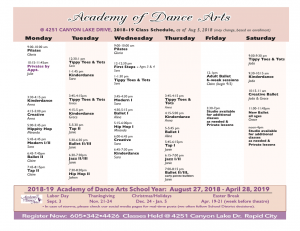 Our Academy family welcomes you and your children with open arms to experience the joy and delight of dance. We take pride in the fact that our studio style is based on nurturing and fostering a love for movement and creativity. This also means that our student-to-teacher ratio is favorable with more individualized attention to each and every beloved student that enters our doors. Our policies are put into place to allow us, as teaching artists, and you as the caregivers, to focus on the quality of instruction provided. 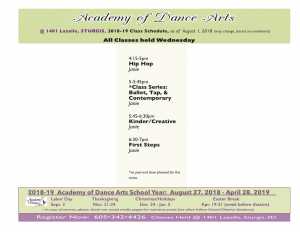 Our class curriculum is based on a normal school-year program. 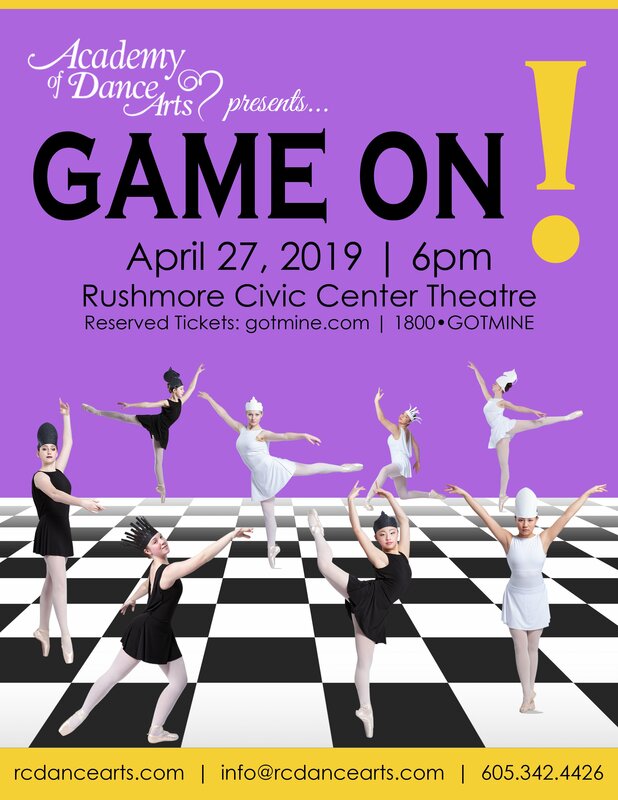 Classes begin in September and continue through May – ending with our annual Spring Recital. The first half the year, dancers will focus on proper technique and skills. In January, instructors will announce recital songs and begin introducing choreography in class. Please see links below for detailed tuition information, schedules, class descriptions, dress codes and registration information. If you have any questions, please do not hesitate to contact us! ♥ For all current Early Childhood families, you may REGISTER ONLINE! Starting with our Summer 2018 session, Early Childhood Students now have the ability to register and pay for all classes online! 3. 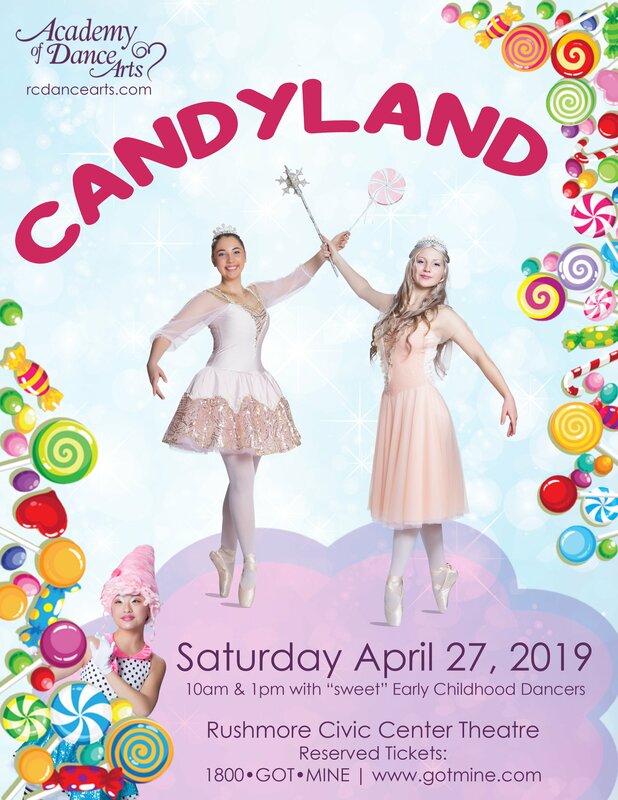 Stop by and register in person! Note: Upper division classes require teacher approval before joining. ♥ For new families interested in the early childhood program, you may REGISTER ONLINE! 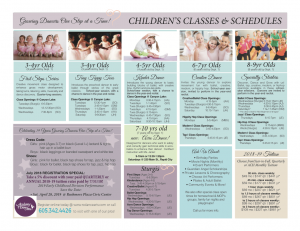 ♥ For new families interested in upper division classes, please contact us for placement. 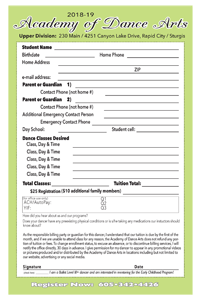 Families with one student will be charged a $25 registration fee each fall. Families with two or more enrolled students will be charged a $35 maximum registration fee each fall. Please click on the image below to view, print or download the pdf documents. Please click on the image below to view, print or download the pdf document. Fall 2018: Families who pay Annual Tuition in Full by 6/30/2018 will receive one FREE costume. 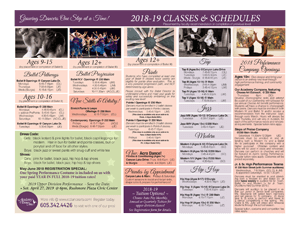 Fall 2018: We also have a family registration discount: $25 for the first child, $10 for the second child, and no registration fees for the third or more. A family will not pay more than $35 in registration fees. If a quarterly or monthly payment is late by one week or more, late fees will be applied for each student. 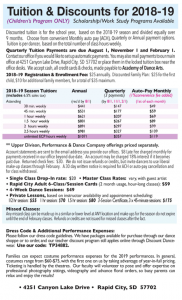 We do not issue refunds or credits but invite dancers to use liberal make-up classes through February. 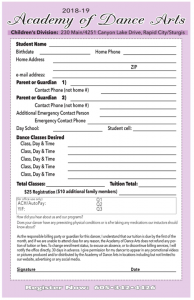 A 30 day written notice is required for ACH or auto-pay cancellation and for class withdrawal. 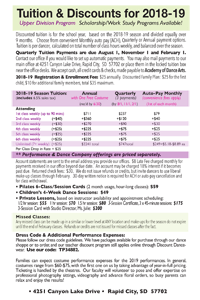 The Academy of Dance Arts offers several convenient ways to pay tuition. We accept cash, check or credit card at both our Canyon Lake Drive and Main Street locations, and we can also accept credit card transactions over the phone. If monthly payments work better for your family, we have an Auto-Pay option available. Convenience Fees apply. *NEW* for SUMMER 2018 & FALL 2018: Early Childhood students have the ability to register and pay tuition online! Click here to register and pay online.